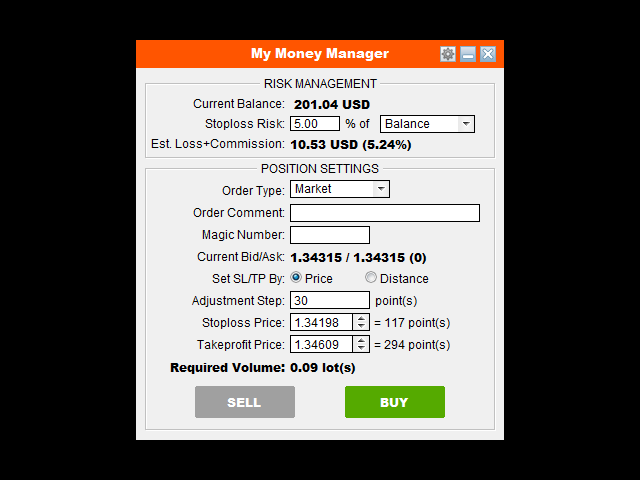 My Money Manager like a risk controller, which places your trades with the exact volume that meets your desired stop loss risk. It can also help you to preview your EP/SL/TP levels before placing an order by dragging these levels directly on a chart, and keep reporting about them during the position opening. With this tool, you will feel more comfortable when deciding to open orders, as well as forecasting your profit/loss with your orders. Placing orders is a very precise and professional work now. Calculate exactly the volume that meets your desired stop loss risk (% of balance), including the commission fee charged by a broker. Allow drag-and-drop EP/SL/TP level directly on a chart to preview before placing orders. Provide one-click-trading for all types of orders. Keep reporting about estimated SL/TP levels when an order is opening. 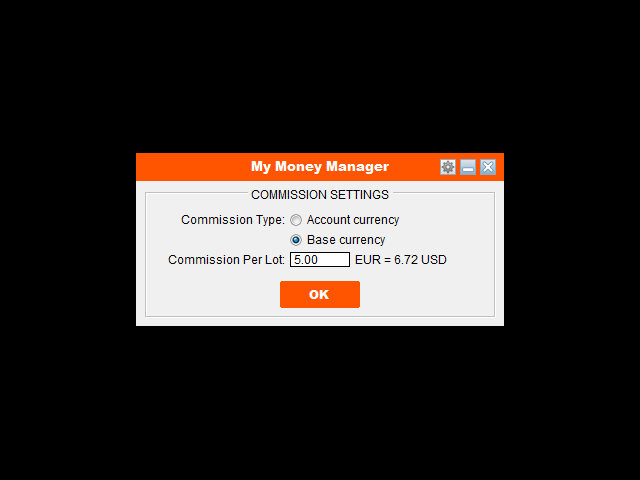 Commission Setting (Menu): Set how your broker charges commission per lot traded. This factor is important to calculate the required volume that meets your stop loss risk. Commission Type: This is how your broker charges commission. It is "Account currency" if commission is charged on account currency unit, and "Base currency" if commission is charged on base currency of trading pair. Commission Per Lot: The amount of currency units that charged as commission for a round turn standard lot. If your broker/account type does not charge commission, just leave this value as zero. Stoploss Risk: The risk percentage that you accept to lose if stop loss occurs. Est. Loss+Commission: The total loss you will incur at stop loss point. This total loss amount includes order's loss and order's commission. Order Type: Choose the order type that you want to take place. Order Comment: Note for your order as regular MT4 order's comment. Magic Number: You can enter a custom magic number to identify your order for further use. Set SL/TP By: Choose how to set Stop loss/Take profit point. It is "Price" if you want to set SL/TP by a certain price value, "Distance" if you want to set them by a distance from the entry point. Adjustment Step: Increase/Decrease space of the price adjustment when using Increase/Decrease arrow button. Stoploss/Takeprofit/Distance: Value to determine the Stop loss/Take profit point. Setting Stop loss point is mandatory to calculate appropriate volume (you may remove Stop loss later if you want, but need to enter a value to calculate volume and place an order). Leave Take profit as zero means setting an order without take profit. Order Dragging feature: When you are setting EP/SL/TP on the control panel, you will also see that there are horizontal lines with corresponding levels on the chart. You can select these lines and drag them to adjust order EP/SL/TP. Due to these levels, order type will be auto selected. - Improved: Allow open multi-positions if calculated lot size is bigger than maximum lot size. - Fixed: Show correct information for Buy Stop/Limit order on the chart. - Fixed: Invalid trading volume if lotsize step was larger than 0.01. - Fixed: Correct calculation for account with exotic balance currency. - Fixed: Fixed eternal loop if click Buy/Sell when AutoTrading is disable. - Fixed: No freeze and looping alert anymore when clicking Buy/Sell at closed market. - Improved: Increase lotsize calculating for exotic pairs. - Improved: Only show trading symbol in Market Watch if necessary. 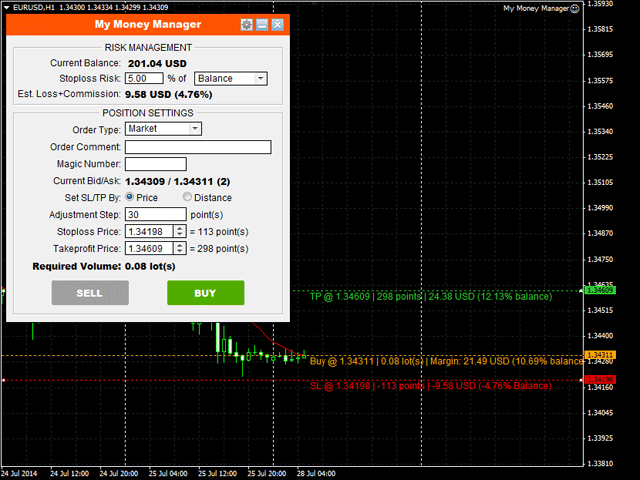 - Added: Risk/Reward Ratio adjustment. - Improved: Support for exotic currency account. - Improved: Support for CFD, Indexes instruments. - Improved: Retrying to open orders/positions until success. - Improved: Better recognition position close for different deviations and filling types. - Fixed: Correct TP point adjustment after placing order in some cases. More compatible with various MT5's order filling policy.